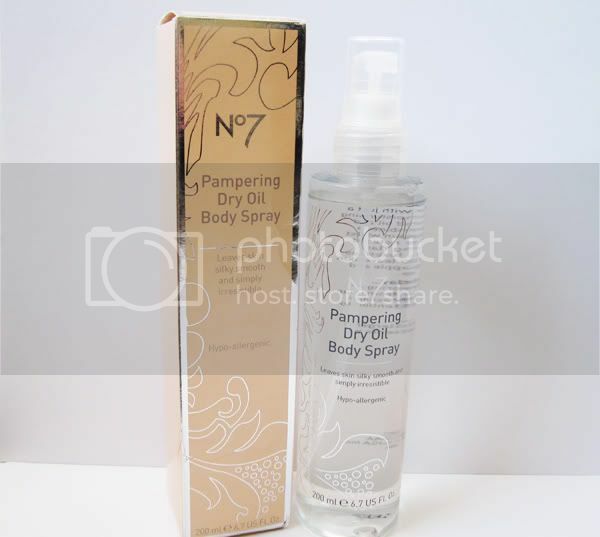 Having accumulated a couple of those £5 off No7 vouchers since Christmas, I finally decided to spend one and picked up the Pampering Dry Oil Body Spray. I love oils probably more than lotions, and this one appealed to me with its handy spray on applicator. It has Almond Oil and Vitamin E in it to nourish and soften the skin, as well as fragrant notes of Vanilla and Ylang Ylang. When I spritzed a little in the shop, the scent was quite light and fresh, but I seriously underestimated how strong it would be when sprayed all over the body! That said, although it's quite a heady perfumed scent, it's one that I would maybe choose to use before going out at night. Formula-wise, the oil is a fine, light, mist that soaks into the skin straight away and without any greasy residue. I wouldn't say it's as moisturising as other body oils I've tried like Weleda's Regenerating Pomegranate Body Oil, but of course it isn't a thick oil and I think the main purpose is mainly to fragrance the skin with a light amount of moisturising going on. Would I buy it at full price? Probably not, but it's certainly worth it to try out when you have a £5 off voucher, which made this 200ml bottle £3.75. What have you been buying with your No7 vouchers? Hmmm-I think I wouldn't mind this! It sounds kind of nice and light which I like when I shower in the morning. I've heard such good things about these, shame this one wasn't too good! Im the same! What are the ingredients in this? I usually buy the nailpolishes.. they're amazing!..